Тема в разделе "FREE EA ARGOLab_eng", создана пользователем Dmitri, 16 Ноябрь 2013. 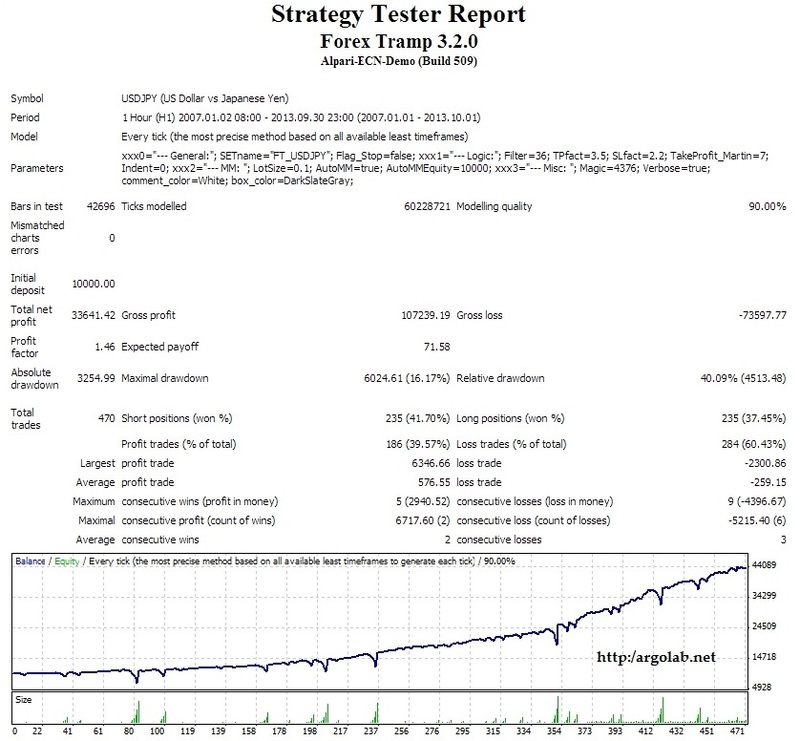 Forex Tramp EA – multicurrency forex robot with soft martingale and steady profit. Flag_Stop (TRUE/FALSE): If this flag is set to TRUE, EA will not open new after the current trade is closed. Filter: The digital filter threshold used for determination of the trading channel. TPfact: Take-profit level, in units of Filter. SLfact: Stop-loss level, in units of Filter. 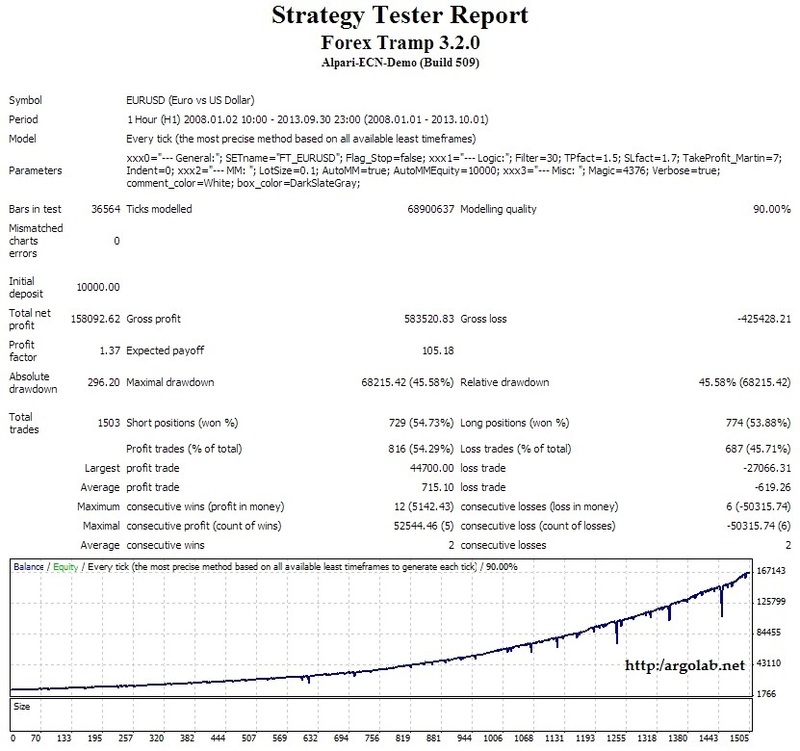 TakeProfit_Martin: This parameter adjusts the increase of the target profit after each false breakout. Indent: Shift of the pending orders from the trading channel borders. LotSize: The value of Base Lot. AutoMM (TRUE/FALSE): When AutoMM = TRUE, the base lot LotSize will be scaled by the ratio (Account balance)/ AutoMMEquity. So, for deposit $20000 and AutoMMEquity=10000 (default value), the starting lot of the basket without trend will be LotSize*(20000/10000) =LotSize*2. Each time the account balance is increased by 1/10 AutoMMEquity as a result of profitable trading, the starting lot will be modified accordingly. AutoMMEquity: parameter of the AutoMM feature. Your product Forex Tramp EA. This uses the martingale system. Has there ever been a time when the trades never reached the level set and you lost the martingale trades as well? In other words is it possible to still lose and no recovery of loss? On the market, everything is possible. Generally, when the number of lost trades becomes large, it is good thing to consider the market state. If you expect breakout of the price (in any direction), let EA trade. If you think that the flate market is likely to continue, it might be better to fix the losses and to start from the beginning. in backtesting tramp I see that occasionally the final trade in a series is closed long before stop loss or take profit, so the loss or profit ends up smaller than expected. Can you tell me what is happening there? I noticed at least once was after a weekend, a few hours after opening... is that a part of the code? Orders are closed only by takeprofit or stoploss. But sometimes stoploss of market orders is modified. This EA trades the breakout of upper or lower extremums. When price breaks out of the upper extremum, we buy. If the stoploss of a buy order becomes worse than the lower extremum, it is modified. it could be an option to open new order right at time and price level of the closed order... or near it. Yes. EA trades breakout from the channel, and the channel needs some time to set up itself, after the previous one was broken. You can just as well increase the takeprofit of the order. Check in tester that it does not improves your results. EA uses pending orders, spread filter does not make any sense in this case. If you foresee high volatility, you may restart EA with larger value of Filter (increase it by 30-50%). Do not forget to return Filter to the old value after volatility is over. so 4.0.0 has an extra filter... can you tell us more about how these filters are designed to work? is it for Monday mornings only, or also daily rollover time? EA trades breakout from the trading range. Just try in visual mode in tester. It should be on during the whole week. EA uses martingale - if orders are closed in loss, EA increases the volume of the next order. Filters determine the position of extremums - the larger the filers, the more significant extremums are taken. Gape protection correct the slippage of the pending orders (after pending order is opened, EA checks that take-profit is OK).